These Jumbo 12 to 14 oz. 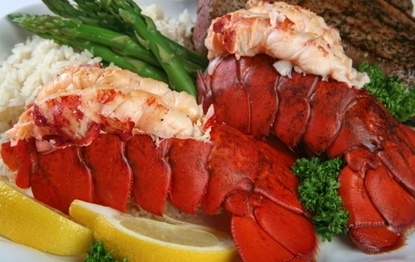 Maine Lobster Tails Are Huge, & Sweet And Tasty! Our Jumbo Maine Lobster Tails are so easy to prepare, baked, stuffed, steamed, or on the Grill! Our 12-14 oz. Maine Lobster Tails Are An Outstanding Gift Choice And A Great Gift Idea For The Holidays, Anniversaries, Birthdays, Or just A Great Thank You! Order Our Jumbo 12-14 oz. Lobstertails Anytime Online OR By 10am EST, And Enjoy Them For Dinner Tomorrow! I just wanted to shoot you a quick email and say your lobsters are THE BEST I've ever had!!!. I am a first time customer and I purchased 4 10-12oz Lobster Tails for my wife, my dad, my mother and myself for Christmas. All of us absolutely were blown away by the quality of the lobster. You have won over my family and definitely me. This may sound weird but I live about 45 mins inland from the coast here in Southern California and it is very very difficult to get good quality seafood. You can be assured that you have customers for life and we will be ordering throughout the year, not just the holidays.